Best of Madison 2018 Gold! 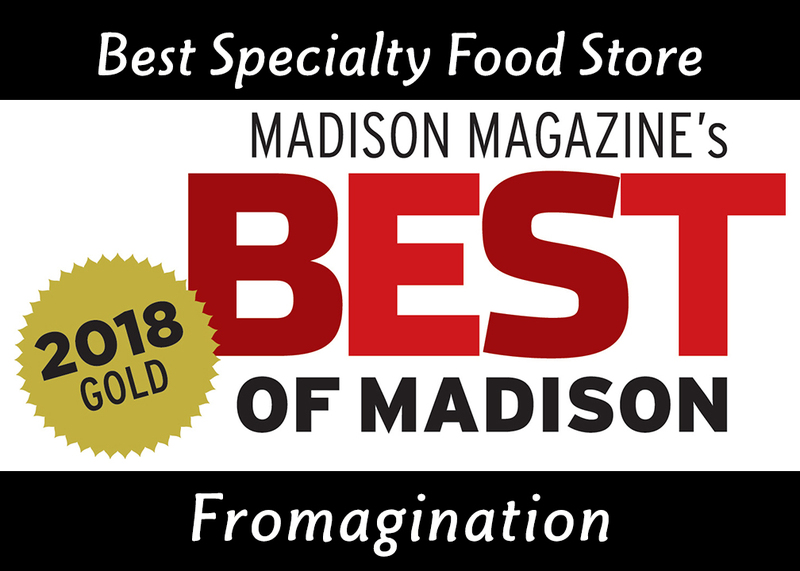 Fromagination’s loyal customers have recognized the shop as the Best Specialty Food Store in Madison for 2018. We got a gold medal during the Olympics! Woo-hoo! It’s a great honor for us, considering all the wonderful food and shops in our city. Our mission of bring Wisconsin’s best artisan cheeses to a wider audience, and highlighting both the cheesemaking heritage of America’s Dairyland and the still-growing local food movement in the Badger State is unfinished. And we appreciate your support while we pursue it. We had stiff competition for this award, as did the winners of other categories, and that’s one of the things that makes Madison, and Dane County, a good place to live. The world of food keeps growing and getting better. See all the winners here! Part of Fromagination’s mission is also to be a supporter of the greater community. To that end, we make donations to good causes such as Proud Theater, Wintersong/Second Harvest, Wisconsin Public Television, Porchlight, Madison Children’s Museum, Silverwood Park, OutReach, Olbrich Botanical Society, FEED Kitchens and others. Our public assets in this place are many and we acknowledge what they to do to strengthen our society. So, we give thanks for being part of the mix of downtown Madison, and of Wisconsin’s blooming food culture. Thank you from the Fromagination staff for the Best of Madison 2018 gold! Having said all that…you should come in and eat some cheese sometime soon! Congrats to you & all of your helpers! You are the BEST!